Recent college graduate Oguro Mikiko has landed her first job, helping with production at a small animation company. Shortly after giving her the tour of the offices, the producer collapses from stress and now it seems it seems that Mikiko (dubbed "Kuromi" by the employees) must take over his duties and ensure that the studio makes their deadline. If she fails, their anime "Time Journeys" will never make it to their audience! Once I learned that this OAV was directed by the talented Daichi Akitarou, I knew I was probably in for a good time or at the minimum at least I would be viewing something worth my time. Daichi's name has been attached to more than a few quality anime productions that have come out of Japan in recent years both in the comedy and more dramatic realm. As they only have forty minutes or so to work with the show and plot are tight in focus. It is a show about a small anime studio producing an episode of a small low-budget (and from the looks of it somewhat lame) retro action show. It seems that most of the people involved in the production process have some sort of quirk or personality issues that are affecting their work and slowing down the production process. 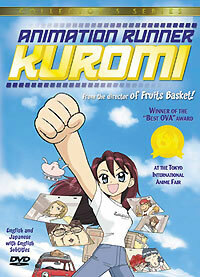 Most of the OAV focuses around the hard-working and earnest Kuromi rushing about trying to cajole, persuade, and organize the various people involved in the production into finishing their tasks. In a sense, one could even say this show is vaguely educational. While not necessarily the world's most entirely accurate representation of the world of low-budget anime production, they do tend to cover most of the major parts of the process and the variety and types of people involved. While in this forty minutes, no particular character gets a particularly great amount of time to develop, they do fill their comedic niches and roles well, resulting in a lot of amusing scenes. One comes to sympathize with poor Kuromi as she desperately just wants to make sure the production is finished but has to deal with a wide assortment of problems from shy perfectionist artists to tracking down mechanical design specialists who do nothing but hang out at the beach all day. Most of these encounters are highly amusing, especially as Kuromi attempts various different tactics to work with each person. This show is more fun than deep, though they do manage to sneak in a few moments of warmth particularly with the motivations of why Mikiko wanted to work in an anime studio to begin with. Some might find some of the sentiment involved toward the end a bit much considering this is ultimately just about some anime studio producing an episode of an action show, but I liked it. On the technical side, this is perhaps not the greatest visual treat ever to come to Japan, but the color work and general design work is still quite good. Also everything from the character designs to the general pacing of scenes works well in reinforcing the fun comedic aspects of this OAV. Interestingly enough, some of the character designs used in various scenes are an homage to various other influential anime and or anime periods. I think the alert viewer will be pleased with such small attention to detail. Recommended Audience: There are a few brief scenes of violence in a few clips from the anime-within-the-anime "Time Journeys" but nothing severe. Overall, there is very little that would be particularly objectionable though I don't know if children would appreciate the comedy of an anime about the making of an anime.